The extreme melting point of Platinum of up to 2000°C requires a specially formulated investment powder to cope with the intense casting conditions. 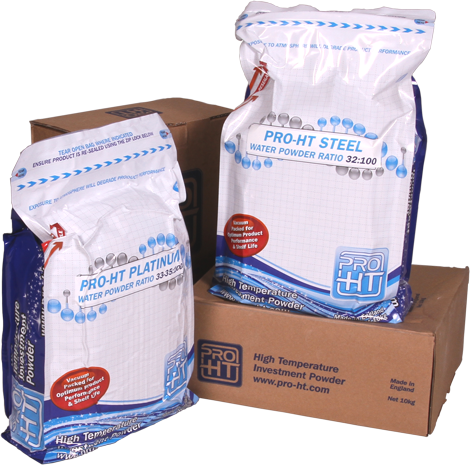 Pro-HT Platinum is a water-based Phosphate-bonded investment powder, which has been successfully used for the casting of Platinum alloy for many years. Traditional Platinum casting investments use a 2-part acid-bonded chemical reaction to attain mould strength at an elevated temperature, whereas Pro-HT Platinum utilises a water-based, phosphate-bonded chemical system and sets in an exothermic reaction at room temperature.